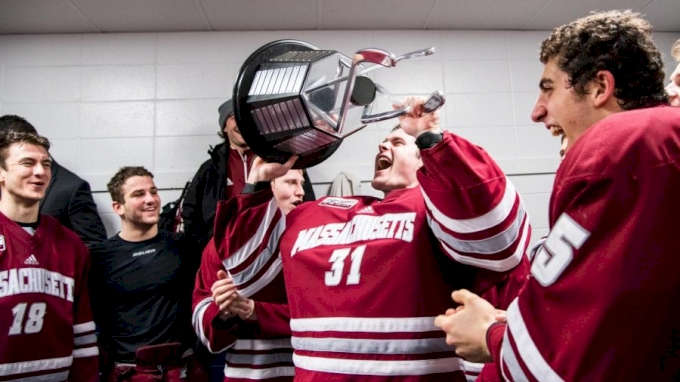 FloHockey continues to form new partnerships and expand its coverage of NCAA hockey, and after deeper dive into Hockey East last week, we’re here to elaborate on another new conference joining us: Atlantic Hockey. With the partnership, FloHockey will stream Atlantic Hockey games through 2022. Atlantic Hockey features 11 teams: Air Force, American International, Army West Point, Bentley, Canisius, Holy Cross, Mercyhurst, Niagara, RIT, Robert Morris and Sacred Heart. Originally founded as the Metro Atlantic Athletic Conference (MAAC) in 1997, the conference was reorganized in 2003 as the Atlantic Hockey Association (AHA), or Atlantic Hockey. Since then, 10 players have moved on to the NHL from the AHA, led by former RIT defensemen Chris Tanev, who is currently skating in his ninth NHL season in as the longest tenured AHA alum. Tanev, 29, has been a strong shutdown defenseman for the Vancouver Canucks during his NHL career and has played a significant role in helping the young, rebuilding team adapt to the world’s best league. Canisius alum, Cory Conacher, has had an esteemed professional career after numerous NCAA hockey accolades, including being named the AHA Player of the Year in 2010, the year he led the conference in scoring. The 5-foot-8 Conacher’s NHL career has been a bit of a rollercoaster, but he’s been an outstanding player in the AHL, where he owns 106 goals and 163 assists for 269 points in 274 games. When it comes to taking the next step, Atlantic Hockey doesn’t hold the same NHL pedigree that other NCAA conferences do, but it’s worked hard to field competitive, and growth has been evident in recent years. Last February, former Mercyhurst goaltender Ryan Zapolski brought some attention to Atlantic Hockey as the starting netminder for Team USA at the 2018 Winter Olympics in Pyeongchang, South Korea, after the NHL opted not to participate for the first time since 1994. In March, Air Force claimed the Atlantic Hockey title for the second straight season. The Fighting Falcons defeated No. 1-ranked St. Cloud State in the opening round of the NCAA Tournament in a stunning 4-1 upset. They lost to eventual champion Minnesota Duluth in the Regional Final, 2-1. It was the second consecutive season in which the Falcons came away with an opening round victory before falling short in the Regional Final, narrowly missing the Frozen Four. This season, the growth has continued. Then there’s Mercyhurst defensemen Joseph Duszak, who sits third in NCAA scoring with 11 goals and 22 assists for 33 points in 25 games. The junior has already eclipsed his points totals from last season and leads the NCAA in defensive scoring by five points. FloHockey is excited to bring Atlantic Hockey’s continued growth right to your devices when the streaking partnership is underway. Until then, check out FloHockey to stream games from the Big Ten, WCHA, and more.